Researchers from Oregon State University (OSU) are tagging whales in a new study using a new type of tag that can record data every second for weeks at a time to give a glimpse into whale behavior and biology that was never before possible. Called the “Advanced Dive Behavior” (ADB) tag, it has allowed researchers to expand their knowledge of whale ecology to areas deep beneath the sea, over thousands of miles of travel, and outline their interaction with their prey. It is able to show them what the whales do while underwater; when, how and where they feed; how they might be affected by passing ships or other noises; and what types of water temperatures they prefer. The findings, published in the journal Ecology and Evolution, showed sperm whales diving all the way to the sea floor more than 1,000 meters deep, and staying submerged for up to 75 minutes. It also reported baleen whales lunging after their food and provided a basis to better understand whale reactions to undersea noises such as sonar or seismic exploration. “This technology has even made whales our partners in acquiring data to better understand ocean conditions and climate change. It gives us vast amounts of new data about water temperatures through space and time, over large distances and in remote locations. We’re learning more about whales, and the whales are helping us to learn more about our own planet,” Mate added. 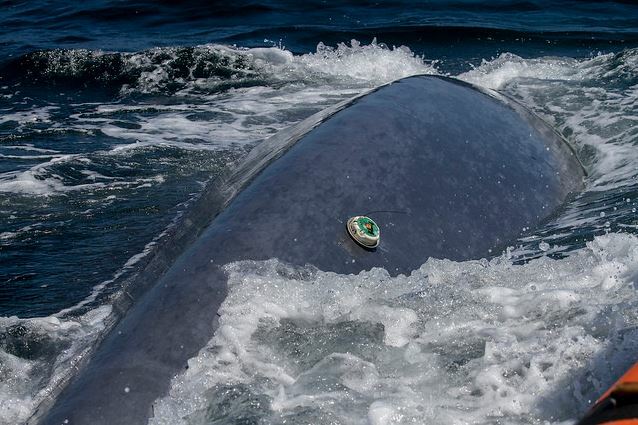 Unlike earlier technology that could not return data from the deep sea for much longer than a day, the ADB tags can acquire data for up to seven weeks at a time, before detaching from the whale, then floating to the surface to be retrieved for its data to be downloaded. The retrieval is a little tricky, but it has worked pretty well, as the tags transmit GPS-quality locations and flash LED lights once they have released.